Today, on April 19, 2010, the anniversary of Waco and Tim McVeigh’s following wacko actions in Oklahoma, there was a group on the National Mall that are convinced that their fellow man is out to do them harm, and that they need to make political moves to ensure that they can protect themselves. Today’s group was the Second Amendment March, a fairly mellow group who gathered lawn chairs, signs and slogans and descended on the place with the most restrictions on guns in the US – Washington, DC. When I look at my own field of public policy – the environment – I start to wonder if maybe these gun rights folks are onto something. No, I don’t think that more liberal gun carrying laws in DC are likely to be the way to move any policy forward which has at its core the betterment of public safety, but an awareness that there are those among us that would happily do us harm unless we protect ourselves…maybe that is a healthy, if depressing, thought that we need to keep in mind as we craft public policy. 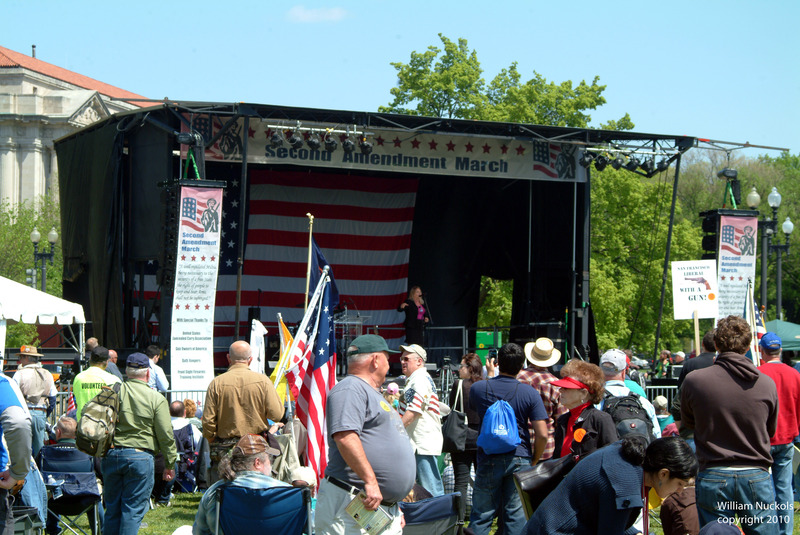 Gun rights advocates at the 2nd Amendment March gather on the Mall in Washington, DC. So if you feel an uneasy feeling that people in your community are trying to hurt you and your family, maybe you should run with that inclination, and rather than worrying about which specific types of firearms you can take with you to the mall and to dinner, you might start worrying about those in your community who put their interests in making money ahead of the interests of you and your family in being able to live a healthy, disease free life. For after all, when citing the need to protect “life, liberty and the pursuit of happiness” it shouldn’t go without notice that life is the first in the list. If life is endangered, and you don’t have clean water, air you can breathe and food to eat that is safe for you and your children, liberty and the pursuit of happiness aren’t achievable anyway. What does it mean to protect life when parts of a community have no qualms at all about harming other parts of the community if it benefits them? In the realm of environmental policy this translates into the need for a robust, well funded and effective regulatory structure to keep the bad guys at bay. After all, it’s not like you are going to take a handgun down to your local coal burning power plant and demand at gunpoint that they clean up their emissions and stop business practices that endanger the health of your family. This is clearly the realm of the state and federal regulators – regulators that few people appreciate and who more often than not are decried as trying to put businesses out of work and hurting American communities with their interference. But reality is a far cry from that ill-informed public view. It is hard to keep any group on message. Carry and conceal? The financial bailout? Health care? Uh, what are we protesting for/against? critical of my own community when I saw today how hard it is to keep any group of people on message. 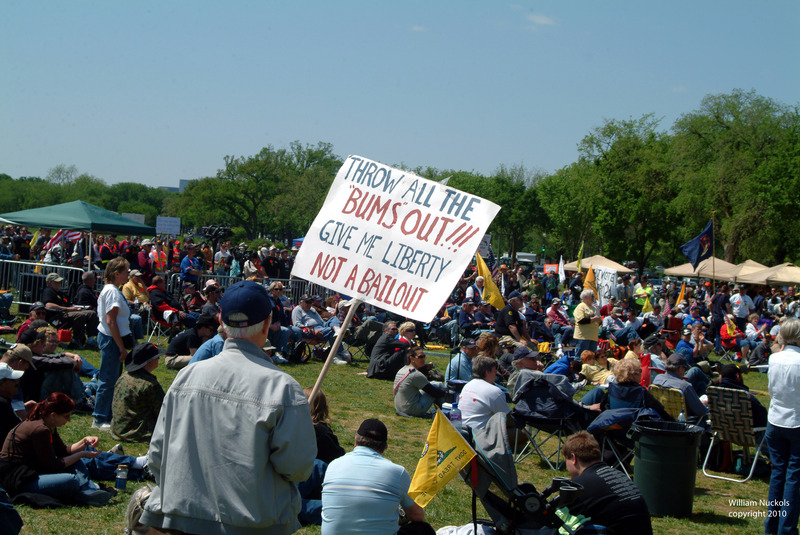 Whether it was the guy with the anti-bailout sign, or those spouting off about healthcare, there were more than a few of today’s second amendment march attendees who didn’t appear to exactly understand what the second amendment says. But if you prefer to have your glass seen as half-full, the right of freedom of speech was alive and well today. And if this week we combine a demand for our right to life, which to me means a right not to be killed by others’ pollution, with our right to free speech, this week in DC and around the nation we might end up with one heck of an Earth Day 40th anniversary celebration. Sometimes reducing marine debris means looking at land-based sources in your own community. In my case “my community” is Washington, DC, and the closest waterbody is the Anacostia River. While a holistic solution to trash in the river is still disturbingly far off, we have been making headway. Councilman Tommy Well’s plastic bag ban/bag fee is both cutting back on the overall use of plastic bags and raising funds to restore the Anacostia River by charging those of us who just must have a one-use plastic bag $0.05 per bag. A Washington Post article says the bag fee has already generated some $150,000 in funds to restore the Anacostia. But there are other ways to protect our river as well. Something as simple as a mechanical filter to hold back sediment and trash from the melting piles at RFK can me a part of a much needed marine debris prevention and cleanup plan. A video I quickly produced highlights the environmental challenge and calls for the Mayor to install sediment controls at RFK Stadium in Washington, DC. On Wednesday March 31st the Navy hosted an environmental forum in Alexandria, VA, bringing together Navy environment and installations leadership from the DC area and around the U.S. to share information about current Navy environmental practices and policies – and in a welcome move toward the open government and transparency goals of the Obama Administration, they invited the NGO environmental community to be a part of the meeting. Our military continues to be ahead of much of the nation on environmental policy. They know that climate change is happening, and they are already working to simultaneously mitigate emissions, reduce energy consumption, tightly control the release of any toxic materials, and find ways to adapt to the changing planet. One aspect of the data presented could have been better: When the topic of climate change and rising seas arose some of the invited NGOs made presentations at the meeting using the same poor map products that show sea levels rising and whole communities, even large parts of states, inundated by seawater. As with so many presentations designed to move people to action on climate change, maps were shown indicating that in the future huge portions of Florida, and other areas, were awash with rising seas. The problem is that these are simple tricks of mapping, where one moves the water elevation from the current waters edge to a point higher on an elevation map. What those maps don’t show is any reasonable prediction of the future given that people aren’t going to just throw up their hands and let the water come in anywhere it can. We don’t act that way now and there is no evidence to say that we will uniformly change our behavior in the future. What these groups are failing use are a series of government-funded maps developed over several years that looked at the east coast of the United States. EPA worked with states and county planners and made educated professional estimates of where will communities work to hold back the sea, where will they likely abandon coastal lands, and which lands currently look like a toss-up. EPA spent years and an estimated two million dollars to develop maps of the east coast of the U.S. which show exactly what military installations managers and environmentalists need to know: what will the east coast of the U.S. look like when existing policies, practices and sea level rise come together at the shoreline. So why aren’t people aware of the EPA study and the maps that contain the likely look of the U.S. east coast shoreline after seas continue to rise? And why aren’t there maps of the Gulf of Mexico, the California-Washington State coastline, Alaska, Hawaii or the territories showing the same information for those communities? I’ll put for the likely answer to those questions in a subsequent posting, or at least provide a few facts and let you draw your own conclusions. For now, kudos to the Navy for a great open and informative meeting on their plans to protected the environment and adapt to the changing climate that they readily admit is already underway.